Musta been near Sonkran with the shirt. Today on my 950cc Moto Guzzi. A quieter shirt and hidden by my-worth-a-fortune geniune falling to pieces 35 y/o Levis Jacket. Oh. and we used to ride from the UK down to the southern part of Italy, with similar attire, many trips via the Alps. Been to CM and back twice on the Guzzi from UT, both times similar attire. Not braggin', just the way it is. If i had to wear fluro jackets & full face helmets over here, IN THIS CLIMATE, i'd probably give up riding motorcycles that i have been doing for 42 years. Hope you won the bet! "Been told i should stay tight left otherwise its suicidal." Beware of that friend - they are trying to kill you! Staying tight left works if you ride a scooter like a bicycle, but ONLY at this pace. If you haven't yet observed and learned to understand Thai traffic flows enough from a scooter I worry about you riding a 300 at speed to be honest, but given that this is what you plan to do keep away from the left of the left lane - too much stuff pulling out in front of you and dogs, etc. If you are riding fast enough you are mostly overtaking not being overtaken and there is a "safety" to this. You have to judge according to the conditions but you will be often in the right-hand lane, or slightly to the right of centre in the left lane. use your mirrors properly so that you are always aware of traffic both in front and behind you, and good luck! 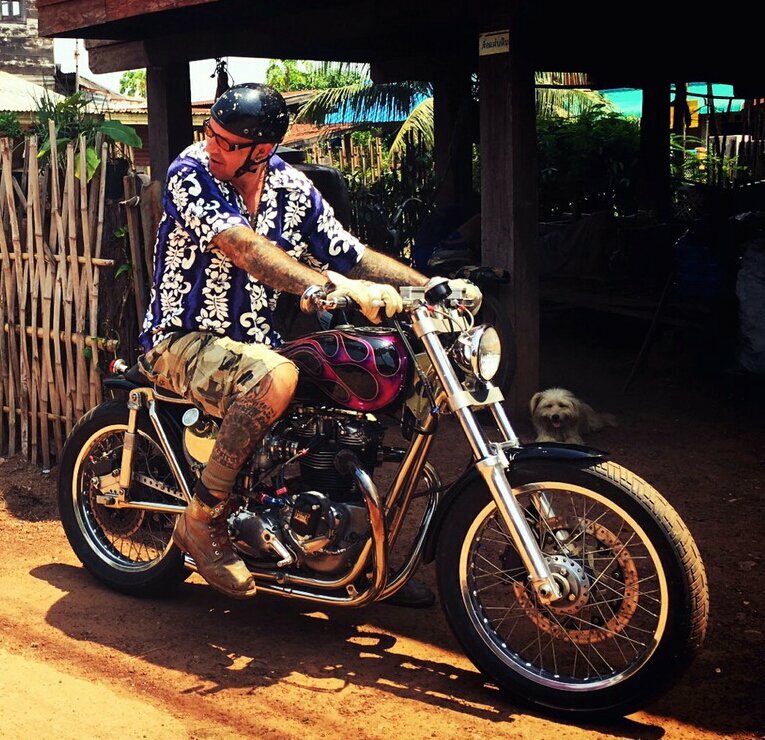 If you are in Chiang Mai, join the Facebook group "Chiang Mai Motorcycle Riders" and ride with some experienced people - following someone with experience can teach you a lot! Ride where it is most safe. Usually hug the centreline as that gives you the most road - on both sides - to take evasive action. Move over for traffic. Look in your mirrors frequently. Anywhere else and you are cutting your chances for survival. Ride dead centre of your lane - and rain comes - all the oil drips from traffic since the last rain will be right there. Death Trap until it washes off. Many years ago I did a couple of weekend 'riding enhancement' courses with police motorcycle instructors in the UK. They would give different advice on slower small motorbikes in Thailand. I did a similar course in UK and the cop behind me didn't make the bend on his Pan-European, Pan am as we called em ended up unhurt in a ditch of water on the side of the road. His police mates gave him some right stick later. Yes, I do agree with your comment regarding slower smaller motorbikes. But I think better advice would be don't use fast highways at all on such machines. Smaller and slower vehicles are a hazard to others and a danger to themselves. But in a land were buffalo frequently wander around on the highways, that's hardly likely to happen. Those Pan Ams never were much in the bends were they! I also did advanced riding in the UK many years ago (I had a bike dealership and used it as a way of drumming up business, also gave cops a 10% discount ), cops were also on the courses, some were good riders, some not so good and relied on being on highly visible cop bikes and people being aware of them and getting out of their way. They tended to taking very wide lines into corners as that was the only way they could get around due to the machinery they were riding. Comfy motorcycle for 2 up touring, a mate had one and we called him our back up tanker when we went for long w/e bike trips. You don't know what's coming from the left, and you don't know who's gona make a savage u-turn on the right lane(s). + the left lane is always fuc***up because that's where all the trucks / bus stops, they damage the road and you got all the sand and dirt there. on 2x2 road stays kind of in the middle, on the right end of the left lane (not sure if that's proper english). Basically always leave some room on your left and right sides to have some time to react to all the craziness going on. They tended to taking very wide lines into corners as that was the only way they could get around due to the machinery they were riding. The police motorcycles are the BMW R1200RT-P and the Yamaha FJR1300. UK police forces withdrew the Honda ST Pan-am because of the death of a Motorcycle policeman they blamed the machine. I had my own view on that. I was told by a very experienced bike rider, many years ago, to treat yourself as a small car and ride accordingly. I guess that needs to be adapted somewhat for Thai roads but maybe a good starting point. What I would not do is ride in the gutter. Bin riding on and off since 1970, but never stop learning ! Lesbian trapped in old man's body & worlds tallest midget. yea, be a lot safer on a TriCity.